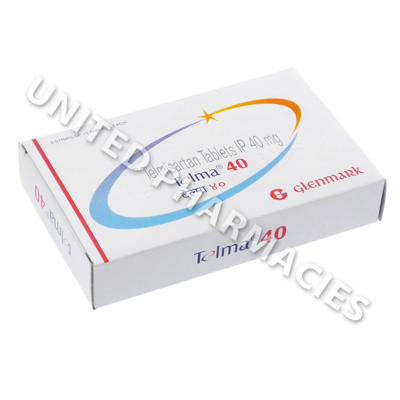 Telma (Telmisartan) is primarily used to lower blood pressure in patients affected by hypertension. However, another use for this drug is being used to lower the risk of stroke or heart attack in patients considered to be at risk of this (due to type 2 diabetes, heart disease or other medical conditions). Manufacturer : Glenmark Pharmaceuticals Ltd.
Telma (Telmisartan) is primarily used to lower blood pressure in patients affected by hypertension. However, another use for this drug is being used to lower the risk of stroke or heart attack in patients considered to be at risk of this (due to type 2 diabetes, heart disease or other medical conditions). This medicine is a type of angiotensin II receptor antagonist, and its mode of action involves blocking the action of the hormone which is responsible for constricting the blood vessels. As a result of this, the blood vessels widen, and blood pressure is reduced. Patients must go and see their doctor for a medical assessment before taking Telma (Telmisartan) tablets. The prescribing doctor will decide whether or not this drug is suitable, and if it is deemed suitable, the correct dosage will be prescribed. Adults undergoing treatment with this drug to lower high blood pressure are often prescribed 40mg per day. This may be adjusted if the doctor believes it to be necessary, and a dosage of 20mg to 80mg may be prescribed. If this drug is being taken to reduce the risk of cardiovascular complications, it is possible that a dosage of 80mg will be prescribed. You must seek immediate medical attention if any serious side effects occur. Examples of this include anaemia, thrombocytopenia, tachycardia, problems affecting the liver and high potassium. It is very important to note that the list of reactions given here is not a complete list of all possible side effects. Never use this drug during pregnancy, as it can cause serious (and in some cases, fatal) harm to the unborn child. Taking this drug can increase potassium levels. It is recommended that you do not use any potassium supplements unless your doctor has told you that it is safe to do so. Always use Telma (Telmisartan) as you have been prescribed by your doctor. Never self-medicate or change your dosage without first consulting your doctor. The correct dosage can vary depending on your health, medical history, and the severity of the condition being treated.